For treatment and control of roundworms, lungworms, grubs, sucking and biting lice, mange mites and horn flies in beef and dairy cattle, including lactating dairy cattle. No meat withdrawal or milk withholding period. For use on cattle 8 weeks of age and older. Dosage is 1 ml for each 22 lbs. body weight. Apply to the backline from the withers to tailhead. Weather conditions, including rainfall do not affect efficacy of eprinex. 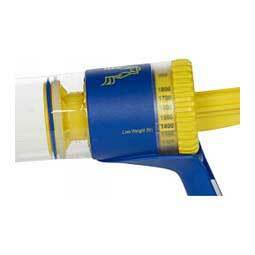 Squeeze measuring dispenser included with 250 ml and 1000 ml sizes. Eprinex Pour-On is rated 4.80 out of 5 by 12. Bought eprinex ivomex because we live near the Oregon coast and receive lots of rain. Works good for lices and other paricites. I have used this product for a number of years not only a great wormer with outstanding features, rain fast and i can sell without the concern of how long its been since I applied the product, but excellent fly control for a least a month. Purchased and used this product a little over a month ago. The results have been great particularly here in South Texas where we have issues late into the year. The best part was the applicator. This made it very easy and accurate to use. Fast and easy to use, no hooking up the spray nozzle, just pour it on and you are done. .